For further information, and details of how to subscribe, see the Social Policy and Practice and OVID websites. 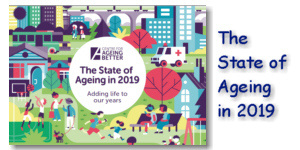 The Centre for Ageing Better has launched The State of Ageing in 2019, a report which gives a snapshot of ageing in the UK, today and in the future. For further information about this and other reports see the CPA Policies on Ageing web pages. 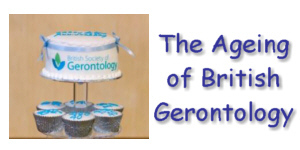 Further useful statistical information about ageing in the UK can be found in the Age UK factsheets "Later Life in the United Kingdom"
The British Society of Gerontology is calling for nominations for the BSG Outstanding Achievement Award 2019 - an annual prize for outstanding contribution to British Social Gerontology. 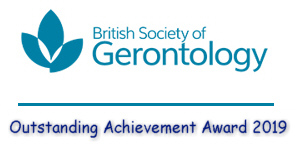 Nominations should be sent to the Secretariat at: info@britishgerontology.org to be received by 5pm, Friday 29 March 2019. For further details view the notification email and nomination form. The Centre for Policy on Ageing, in collaboration with Community Catalysts is launching a new project Embracing Ageing. The project, funded by the Esmee Fairbairn Foundation and in partnership with New Philanthropy Capital (NPC), aims to try to demonstrate how people in a neighbourhood can work together with local organisations and businesses to: Plan together to respond to the opportunities and challenges of living longer; Align local resource to meet local priorities; and Design and test specific local services and products attuned to an ageing society. Further details and how to participate. 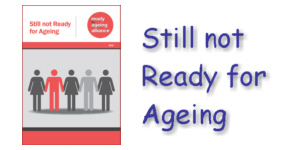 Ageing Without Children (AWOC) has re-launched as Ageing Well without Children (AWwoC). 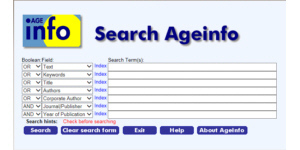 For easy access to this, and other organisations active in the field of ageing, go to the CPA Ageinfo World of Ageing web page with its unique search facility. The Centre for Policy on Ageing, hosts Ageinfo, the UK's only bibliographic database dedicated to ageing and older age. The Ageinfo data is also available as part of the wider Social Policy and Practice database hosted by OVID. For further information, and details of how to subscribe, see the Social Policy and Practice and OVID websites. 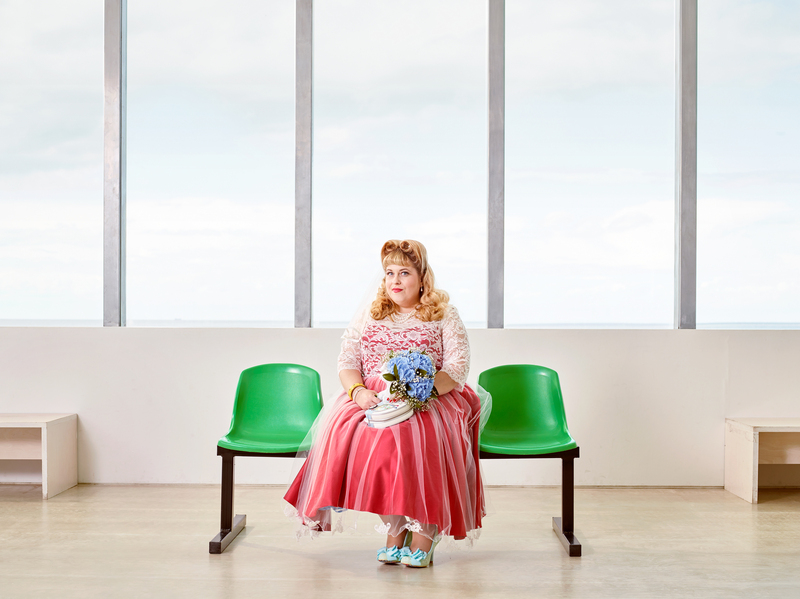 Ages Of Us (UK) is a collaboration between Dylan Collard a professional photographer and Dave Martin, an artist and associate with the Centre for Policy on Ageing. An event, creating photographic portraits across the life course, took place at the British Museum, on October 6th 2018, as part of the Age Friendly Museums Network celebrations. This was followed by an exhibition of the portraits in the British Museum's Clore Centre from 26th November 2018 to 6th February 2019. The image shown has been shortlisted for the British Journal of Photography, Portrait of Britain award and was the subject of an article in The Isle of Thanet News. The Centre for Ageing Better has launched an updated future strategy focussing on people approaching later life and at risk of missing out on a good later life. The updated strategy has four priority goals related to: Fulfilling work; Safe and accessible homes; Connected communities; and Healthy ageing. 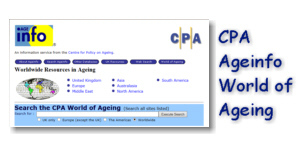 For further information see the CPA Policies on Ageing web pages. The University of Kent and the Centre for Policy on Ageing invite photographers, poets, musicians, dancers, writers and film makers, of all ages, to explore and re-postion thinking about ageing. An initial event, A creative exploration of ageing across our lives, took place on Saturday 21 July 2018, at Keynes College, University of Kent, - Full details. 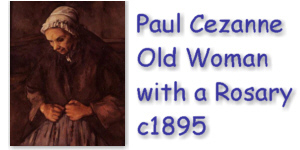 Details of this, and other events, can also be found on the CPA Events Resource. 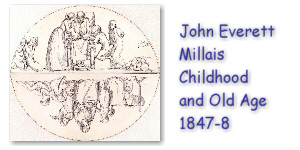 These drawings, made by John Everett Millais in 1847-48, contrast Childhood and Old Age.The drawings, which can be seen at The Royal Academy in London, were in preparation for a series of painted 'lunettes', including four 'Ages of Man', on display in Leeds City Art Gallery. Thankyou for coming to see us on stand 12 at the British Society of Gerontology, Annual Conference 2018 held in Manchester from Wednesday 4th July 2018 to Friday 6th July 2018. This year's theme was Ageing in an Unequal World. Details of the conference, and associated events, can be found on the conference website. 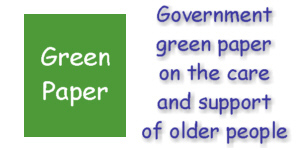 The UK goverment has announced that it will publish a green paper on care and support for older people by the end of 2018. The government will work with "independent experts, stakeholders and users to shape the long-term reforms that will be proposed" and, once published, the green paper will be subject to a full public consultation. The CPA Ageinfo database provides access to over 60,000 books, articles and reports, on ageing and older age, held at the Centre for Policy on Ageing. By appointment, visitors can view items from the collection, Monday - Friday, 10.00am to 5.00pm. 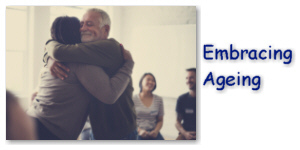 The Centre for Policy on Ageing, in partnership with the Age Action Alliance Working Group on Valuing Older People�s Contribution, is developing the use, with midlife peers, of experiential short courses to ease the transition into retirement. The courses, based on real-life storytelling and coaching, develop emotional resilience and self-direction. 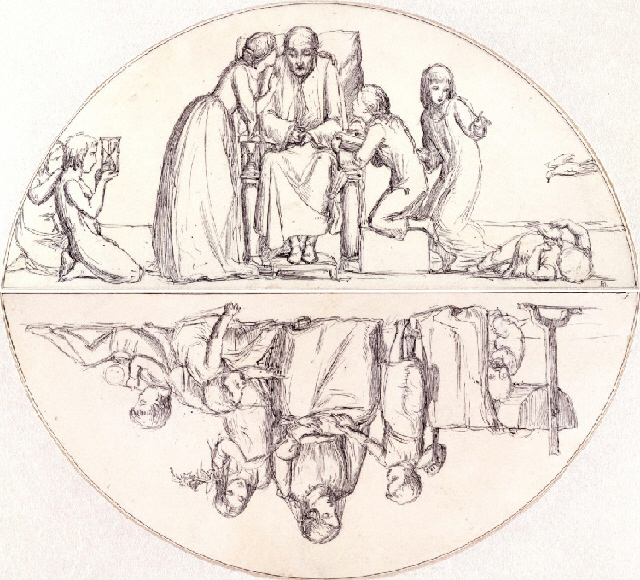 The work is part of the Calouste Gulbenkian Transitions in Later Life programme, where a podcast about the CPA work can be found. 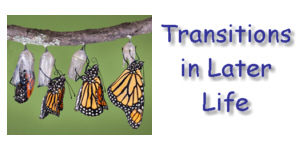 An evaluation report, executive summary and Insight report for the Transitions programme were launched on 5th October 2017, including findings from a YouGov survey. Further details can be found on the CPA Policies on Ageing web page. The BMA Foundation for Medical Research is offering the Dawkins and Strutt research grant of £60,000, to assist research into multimorbidity in an ageing population in the UK. Applicants must be UK registered medical practitioners or research scientists working in the UK. The deadline for submissions is Friday 2 March 2018. 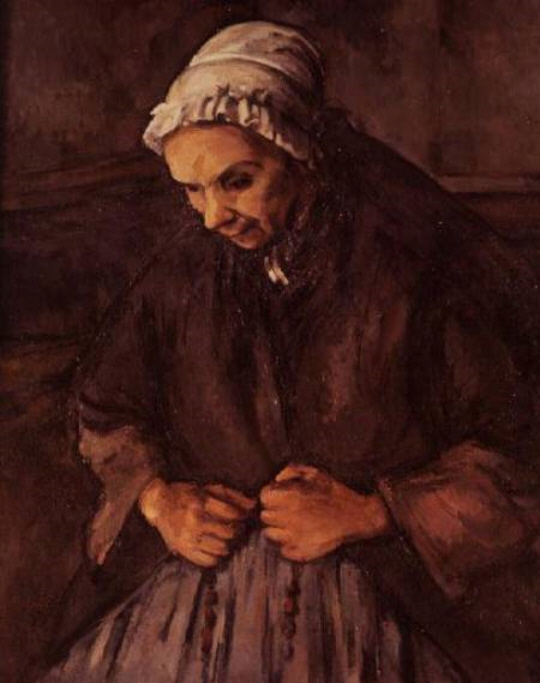 This portrait by Paul Cezanne, on display at the National Portrait Gallery in London, until 11th February 2018, captures some of the pathos and sadness often associated with older age. 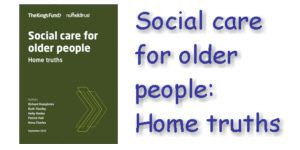 For the latest thinking on how to improve quality of life in older age see Ageinfo, New Literature on Old Age and Policies on Ageing on this website. The UK parliament Health and Communities and Local Government Committees are jointly carrying out a short inquiry into the long-term funding of adult social care to identify funding reforms which will command broad consensus. The deadline for written submissions is Wednesday 7 March 2018 and these will feed into the government green paper. Further details can be found on the CPA Policies on Ageing web page. 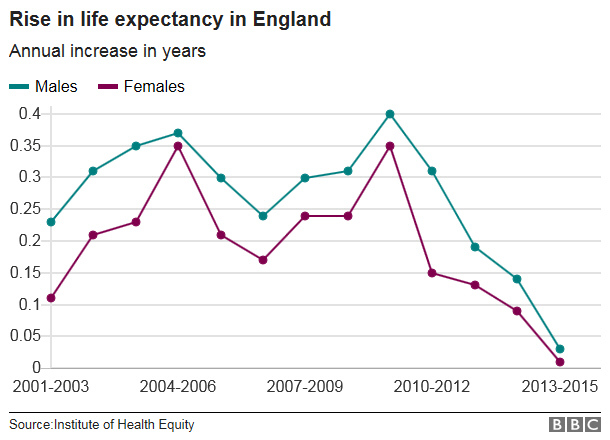 The Institute of Health Equity has released the Marmot health inequality indicators for 2017 showing that, since 2010, life expectancy at birth and life expectancy at age 65 have both 'stalled' falling well below the upward trend establised since 2000. Further details can be found on the CPA Policies on Ageing web page. 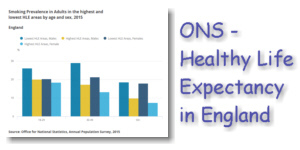 ONS has carried out a regional analysis confirming that Healthy Life Expectancy is related to levels of preventable illness, episode rates for alcohol related conditions, levels of physical activity, adherence to healthy eating guidelines, smoking prevalance and levels of obesity. Areas with higher levels of unemployment and a higher proportion of routine and semi-routine occupations have lower levels of Healthy Life Expectancy. Further details of this report, and other key policy documents, can be found on the CPA Policies on Ageing web page. The Centre for Policy on Ageing, hosts Ageinfo, the UK's only bibliographic database dedicated to ageing and older age. The Ageinfo data is also available as part of the wider Social Policy and Practice database hosted by OVID. During October 2017, Social Policy and Practice was OVID's Resource of the Month and was freely available to use during that period. 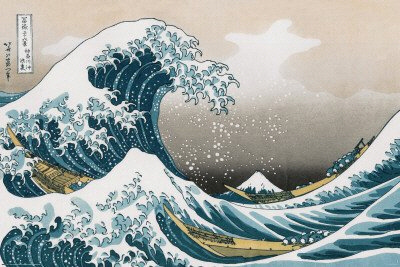 On show at the British Museum until 13th August 2017, Katsushika Hokusai created his iconic work "The Great Wave off Kanagawa" in 1831 at the age of 71. Following that under the name "Gakyo Rojin Manji" (The Old Man Mad About Art) he considered that his artistic work was continuing to improve and on his death bed at the age of 89 he said "... Just another five more years, then I could become a real painter." 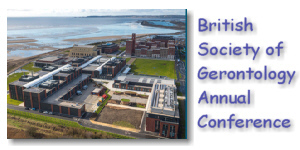 The British Society of Gerontology 2017 annual conference "Do Not Go Gently" - Gerontology and a Good Old Age is taking place at the University of Swansea from 5th - 7th July 2017. The programme explores "The Art of Ageing" and aims to reflect the diversity of gerontology. 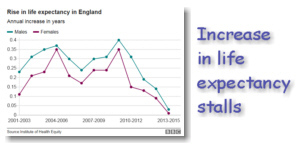 ONS, together with Eurostat has carried out a study of persistent poverty in the UK and Europe. 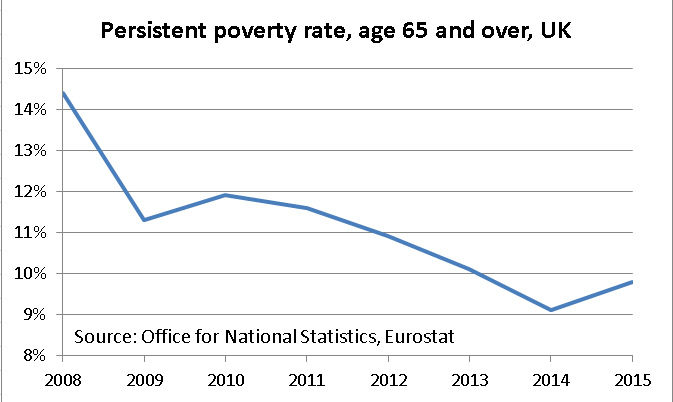 In 2014, for the first time since 2010, persistent poverty in over 65s in the UK has started to increase. For further details of this study, and other key policy documents, see the the CPA Policies on Ageing web page. 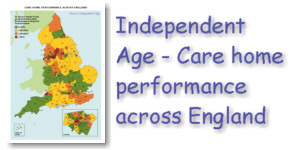 Independent Age has carried out a regional analysis of care home performance in England based on CQC data. John Cridland, on behalf of the Department for Work and Pensions, has carried out an independent review of the state pension age. A summary of the final report can be found on the CPA Policies on Ageing web page. 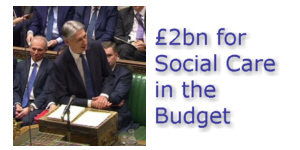 The Centre for Policy on Ageing welcomes the £2bn, over 3 years, additional funding for Social Care outlined in the March 8th Budget and looks forward to a long term resolution of the funding issue. CPA has looked at the approaches adopted in Germany and Japan as part of a number of International Case Studies. 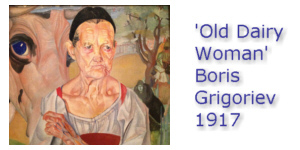 Boris Grigoriev's painting 'Old Dairy Woman', painted in 1917, and on display at the Royal Academy in London until 17 April 2017, reminds us of the harsh realities of rural ageing in pre- and post-revolutionary Russia while highlighting resilience and stoicism in older age. The Centre for Policy on Ageing website has a number of resources on ageing and older age, including the Policies on Ageing page, with links to key policy documents, the Ageinfo database, which helps to locate books, articles and reports, and CPA's own Reports and Reviews including a review of Resilience in Older Age. March 8th 2017 marked International Women's Day with an emphasis on women's education, including that of older women. The day also saw the publication of IES blogs highlighting the problems faced by women balancing career and caring responsibilities and older women at work. For further information see the CPA Policies on Ageing web pages and CPA's own review on Sandwich Generation Carers. The Annual Report of the Chief Medical Officer - Baby Boomers: Fit for the Future, notes that �good' work is good for health and self-esteem and that for older people to work longer may help them to help stay healthy for longer. The Nuffield Trust, Health Foundation and Kings Fund have made a joint statement outlining how the Social Care system is increasingly struggling to meet the needs of older people, their families and carers and the need to bring forward the additional funding that will be provided through the Better Care Fund. 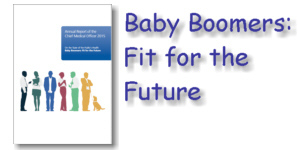 For details of the report and further information see the CPA Policies on Ageing web page. John Cridland, on behalf of the Department for Work and Pensions, has carried out an independent review of the state pension age and produced an interim report to which responses are requested by 31st December 2016. For more information see the CPA Policies on Ageing web page. 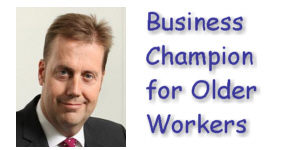 Damian Green, Secretary of State for Work and Pensions, has appointed Andy Briggs, CEO of Aviva UK & Ireland Life and chair of Business in the Community�s Age at Work Leadership Team, as Business Champion for Older Workers. His role will be to encourage other chief executives to retain and recruit older staff. 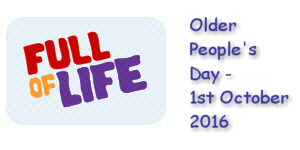 October 1st 2016 was International Older Person's day.The 2016 United Nations International Day of Older Persons (UNIDOP) will take a stand against ageism by drawing attention to and challenging negative stereotypes and misconceptions about older persons and ageing. 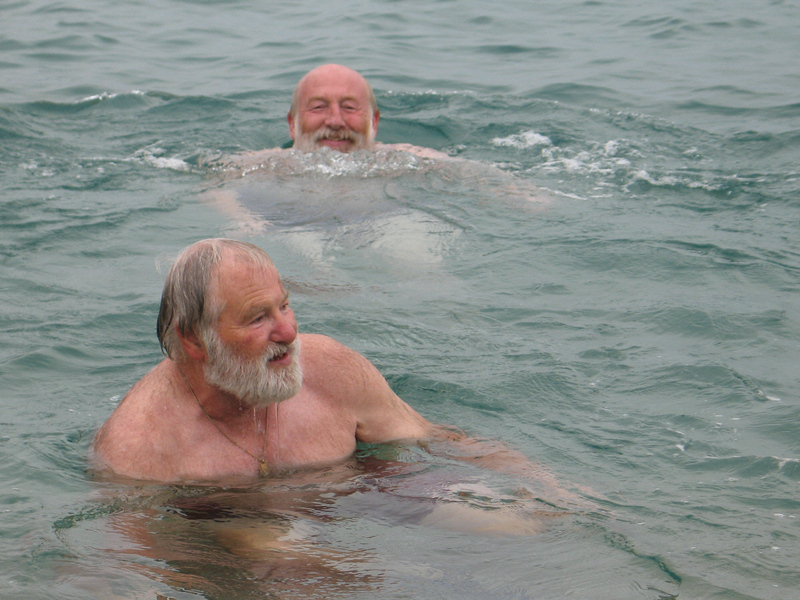 UK Older People�s Day, with local events, for example in East Sussex, coincides with the international event. 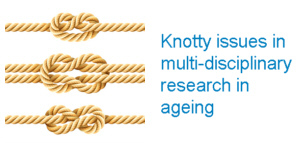 This is exemplified by the recent Social care for older people report by the Kings Fund and Nuffield Trust. The Kings Fund and Nuffield Trust have jointly published a key report on Social care for older people. 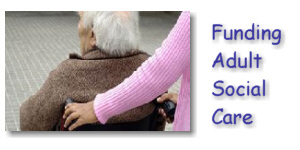 The report looks at the current state of social care services for older people in England. It finds that social care for older people is under massive pressure and increasing numbers of older people are not receiving the help they need, which in turn puts a strain on carers. For further information see the CPA Policies on Ageing web page. 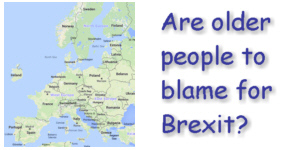 Older people have been unfairly blamed for the Brexit result in the recent EU referendum, with the risk of stirring up inter-generational tensions. Caroline Abrahams of Age UK and Jilly Forster of Forster UK Social Change PR Agency consider the issues. Meanwhile, the Resolution Foundation has established an Intergenerational Commission to further explore questions of intergenerational fairness. 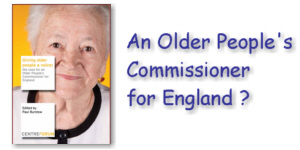 CPA welcomes discussion on whether the introduction of an Older People's Commissioner for England will enhance the interests and representation of older people. For Paul Burstow's report and further information see the CPA Policies on Ageing web page. 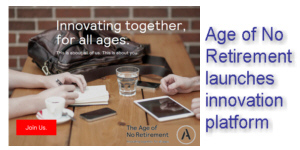 The Age of No Retirement has launched its innovation platform which allows individuals to get involved, submit ideas and interact with each other. The programme is made up of a series of challenges with each challenge typically running for four to six weeks. 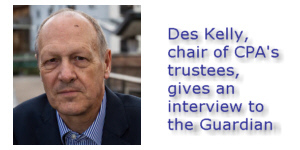 Des Kelly OBE , chair of CPA's trustees, is stepping down as Director of the National Care Forum (NCF), the umbrella body for not-for-profit care providers. In an interview for the Guardian he warns that three quarters of care homes in England are now 'for profit' organisations which does not represent a healthy mixed economy. He puts forward the view that that the best social care, whether residential or at home, is local and that "smaller is often better". For the full interview see www.theguardian.com. 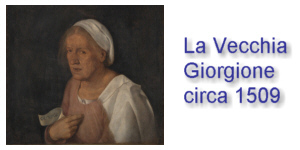 Giorgione's portrait of his mother, painted in Renaissance Venice in around 1508-1510, and on display at the Royal Academy in London until 5th June 2016, reminds us that ageing is something to be both celebrated and addressed, that is as old as humanity itself. The Centre for Policy on Ageing website has a number of resources on ageing and older age, including the Policies on Ageing page, with links to key policy documents, and the Ageinfo database, which helps to locate books, articles and reports. The Centre for Policy on Ageing and the British Society of Gerontology are supporting the Leverhulme Trust funded research project The Ageing of British Gerontology: learning from the past to inform the future. CPA hosts the BSG archive and many key publications from the history of UK gerontology are held in the CPA collection. The Department for Work and Pensions is carrying out three surveys, aimed at people in their 40s, 50s, 60s and beyond, The first survey, for people in their 40s, aims to find out where they would like / expect to find messages about options for working longer, and what might motivate them to start thinking about retirement. The second survey, for working people in their 50s,is about the decision to retire and what or who will influence that decision. The third survey, for retired older people (aged 60+), is about what or who influenced the decision to retire. Closing date is 27th April 2016. 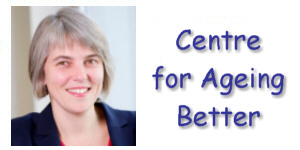 The Centre for Policy on Ageing attended the launch of the Centre for Ageing Better on Wednesday 2nd December 2015. CPA looks forward to supporting CfAB in its future work. The Centre for Ageing Better used the opportunity to launch the Ipsos MORI report Later Life in 2015. 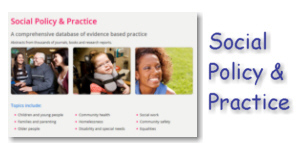 For further details of this and other key publications see the CPA Policies on Ageing web page	. 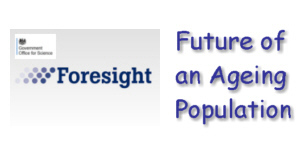 Between June and September 2015, the Government Office for Science has published 22 evidence reviews that it has commissioned as part of the Foresight 'Future of an Ageing Population' project, analysing the opportunities and challenges of an ageing society. For details of the reviews see the CPA policies on ageing web page. Recent titles in the Representation of Older People in Ageing Research series produced jointly with the Open University Centre for Ageing and Biographical Studies include report No 14 Studies of Ageing Masculinities: Still in Their Infancy?, edited by Anna Tarrant and Jackie Watts; and report No 13 Imagining Futures: Methodological Issues for Research into Ageing edited by Joanna Bornat and Rebecca Jones. Previous titles include, Coproduction? 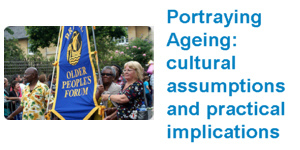 Working with existing older people's groups edited by Josie Tetley, Jacqueline Watts and Jill Reynolds and Secondary Analysis and reusing archived data in the context of ageing and biography edited by Joanna Bornat, Julia Johnson and Jill Reynolds. The titles can be ordered online by following the links above.For further information about the series see the CPA 'Publications' web page. 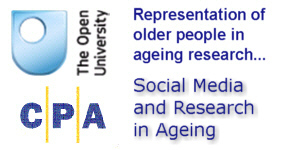 This latest in the joint CPA/OU "Representation of Older People in Ageing Research" seminar series looked at the issues involved in research and social media. The seminar considered two distinct but closely related issues: Firstly "How social media are used to develop distinctive research methods and how the use of social media can enhance established research methods" and secondly "The implications of research findings about older people's use (and non-use) of social media". See CPA Events for details of future events. 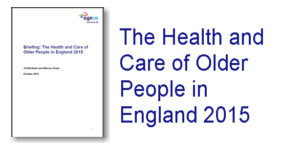 On 21st October 2015 AgeUK published a very useful briefing summarising the current situation in respect of the health and care of older people in England. For more details of this and other policy documents on ageing and older age issues see the CPA policies on ageing web pages. 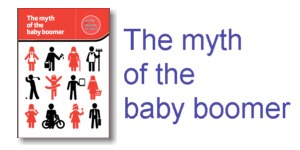 18th August 2015: The Ready for Ageing Alliance, of which CPA is a member, has launched a brief report which explodes the myth of the 'baby boomers' as a uniform group of older people in the UK who have benefitted at the expense of younger age groups. 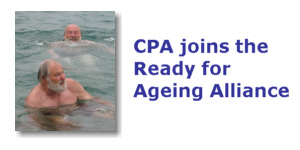 For further details see the CPA 'Policies on Ageing' web page. 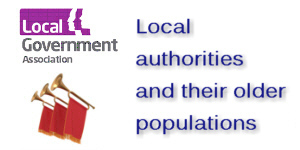 Using evidence gathered by CPA, the Local Government Association has published its report Ageing: the silver lining on the opportunities and challenges of an ageing society for local government. All evidence submitted for the report, CPA's summary of the evidence and a sample assessment of the preparedness of local authorities, can be found on the Results of the CPA/LGA Call for Evidence web page.Further details of the call itself can be found on the CPA "Call for Evidence" web page. 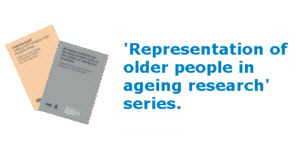 This latest in the joint CPA/OU "Representation of Older People in Ageing Research" seminar series took place on Friday 14th November 2014 in London. This very successful seminar was fully subscribed. For details of speakers etc, download the flyer. 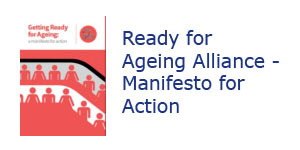 The Ready for Ageing Alliance, of which CPA is a member, has launched its manifesto setting out ideas for how policymakers can better respond to the challenges of ageing. The Alliance, a coalition of 8 organisations, came together in 2013 to make the case for action to ensure that our society is ready for our ageing. It has previously set out an eleven point prescription to help individuals prepare for ageing. More details of the manifesto and its launch can be found in the press release and the CPA policies on ageing web resource..
On Tuesday 2nd September 2014, at BSG 2014, CPA launched the newest title in the Representation of Older People in Ageing Research series produced jointly with the Open University Centre for Ageing and Biographical Studies. 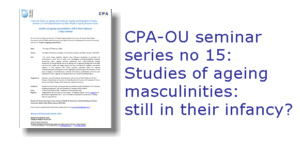 The report No 14 Studies of Ageing Masculinities: Still in Their Infancy? is edited by Anna Tarrant and Jackie Watts. In June 2014 CPA launched No 13 Imagining Futures: Methodological Issues for Research into Ageing edited by Joanna Bornat and Rebecca Jones, �10. Previous titles include, Coproduction? Working with existing older people's groups edited by Josie Tetley, Jacqueline Watts and Jill Reynolds and Secondary Analysis and reusing archived data in the context of ageing and biography edited by Joanna Bornat, Julia Johnson and Jill Reynolds are dedicated to the memory of Jill Reynolds. 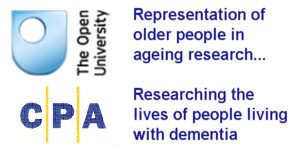 This latest seminar, on Thursday 26th June 2014, from the Centre for Ageing and Biographical Studies (CABS) at The Open University and the Centre for Policy on Ageing (CPA), looked at the issues involved in multi/inter-disciplinary research. Gerontology has long been seen as an area for multi-disciplinary and inter-disciplinary research essential to the understanding of human ageing with specific institutional examples of collaborative working since the 1980s. The more complex issue of inter-disciplinary work, where approaches are integrated rather than viewed separately, has raised a number of obstacles. This seminar heard from those who have been part of this history, and brought together social gerontologists and experts from the arts, humanities and design/ergonomics to address a variety of questions. Programme; Registration and further details. The seminar also saw the the launch of Imagining Futures, the latest in the Representation of Older People in Ageing Research series from from the Centre for Ageing and Biographical Studies at the Open University and the Centre for Policy on Ageing. Age and ageing are, in part, cultural and social constructs. The ways in which individuals, and the societies they live in, perceive and portray age and ageing affect how we understand and respond to an ageing population. This one-day conference on 28th April 2014, organised jointly by The British Library, Centre for Policy on Ageing and Queen Mary College, brought together experts from different backgrounds to share and discuss, the many ways in which age and ageing are portrayed and understood and how insights from research can be translated into policy and practice. Speakers included Julia Twigg, from the University of Kent at Canterbury; Debora Price from the Institute of Gerontology at King�s College, London; and Angus Hanton, co-founder of the Intergenerational Foundation. CPA would like to thank all those involved for a very successful conference. The Centre for Policy on Ageing's popular Policies on Ageing web page provides a brief introduction to key current policy issues in ageing and older age and an easy link to source documents. The Centre for Policy on Ageing has joined with Age UK, Anchor, Independent Age, the International Longevity Centre UK,and the Joseph Rowntree Foundation to form the Ready for Ageing Alliance. The purpose of the alliance is to urge the Government and all political parties to face up to the major changes and challenges from our rapidly ageing society following the report of the House of Lords Select Committee on Public Service and Demographic Change (see below). For further information see the press release to mark the launch of the Alliance. On 3rd May 2013 the Alliance sent an open letter to the prime minister, the Rt Hon David Cameron MP, seeking a positive response from Government to the House of Lords Ready for Ageing Report. The government response was published on 18th July. 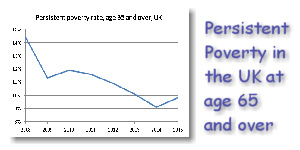 For further information see the CPA 'Policies on Ageing' web page. 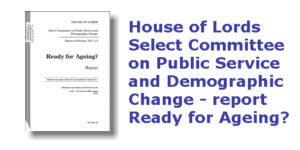 The House of Lords Select Committee on Public Service and Demographic Change's Ready for Ageing? 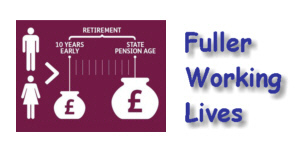 report highlights the lack for preparedness in government, public services and the financial sector for future increases in longevity and the corresponding ageing of the UK population. The committee draws a number of conclusions and makes recommendations for action both before and after the 2015 general election. For further information see the CPA Policies on Ageing page. 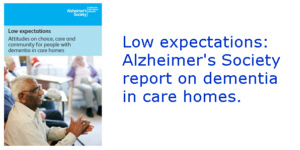 The Alzheimer's Society report, Low expectations, released on 26th February 2013 reveals that up to 80% of care home residents may have dementia and highlights the low expectations that people have for the residential care of people with dementia,The Centre for Policy on Ageing's profile of residents in Bupa care homes also throws light on the prevalence of dementia in care homes and how this is changing over time. The CPA report updates CPA's earlier report on the changing role of care homes which summarised developments in residential and nursing home care historically and to 2009. For further information see our Policies on Ageing page. 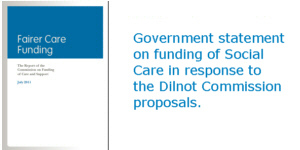 On 11th February 2013 the government announced its response to the Dilnot Commission's proposals for the funding of social care with measures to be implemented from April 2017. The Centre for Policy on Ageing welcomes the acceptance by the government of the principle of the Dilnot Commission report that there should be a cap on later life social care costs that have to be met by the individual. CPA also welcomes the raising of the threshold for support to �123,000 so that more older people on low income can receive financial support. It is hoped that over time, and as the economic situation allows, the cap of £75,000 at 2017 prices can be reduced, in real terms, to levels closer to those proposed by Dilnot. In short, CPA welcomes the principle but not the principal of this announcement. For further information see our Policies on Ageing page. CPA is a member of the Care and Support Alliance. The Centre for Policy on Ageing and the Centre for Ageing and Biographical Studies at the Open University, on Thursday 14th February 2013, are holding Seminar 15 in their Representations of Older People in Ageing Research seminar series. The seminar, entitled "Studies in ageing masculinities: still in their infancy?" will be held at the OU's premises in London. Details are on the CPA Events web page. This seminar series has generated an associated set of popular CPA/OU summary publications, available via the CPA publications pages or download information about forthcoming titles. 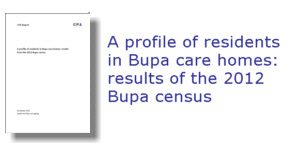 The Centre for Policy on Ageing's profile of residents in Bupa care homes uses data from the 2012 Bupa census of its care home residents to provide an up-to-date picture of the current Bupa care home population and how that population has changed since earlier censuses in 2003, 2006 and 2009. The report updates CPA's earlier report on the changing role of care homes which summarised developments in residential and nursing home care historically and to 2009. 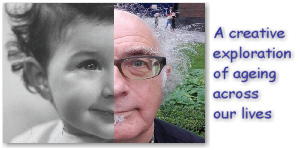 2012 was the 'European Year for Active Ageing and Solidarity between Generations' . The main objectives was to promote active ageing in employment; promote active ageing in the community through active citizenship, volunteering and caring; promote active ageing at home through enabling healthy ageing and independent living and enhance cooperation and solidarity between generations. 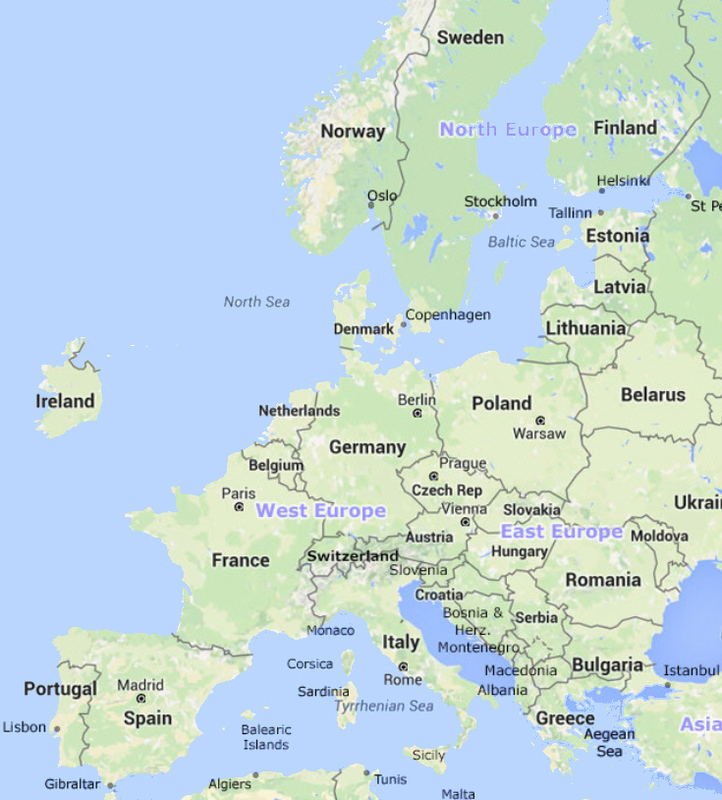 In 2002, EU member states adopted the United Nations' International Plan of Action on Ageing and endorsed the Regional Implementation Strategy for Europe. 2012 marks the 10th anniversary of this event. 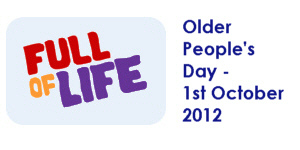 October 1st 2012 marked UK Older People's day. It also marked the full implementation of the ban on age discrimination in the provision of goods and services incorporated in the Equality Act 2010. With a few notable exceptions, for example in the provision of insurance and other financial services, negative age discrimination in the provision of goods and services can only take place if objectively justified. (see the CPA Policies on Ageing web page) In the run up to the Act, the Centre for Policy on Ageing carried out a number of reviews of age discrimination in health and social care in the UK. Health and Social Care services, including the NHS, are not exempt from the provisions of the act. 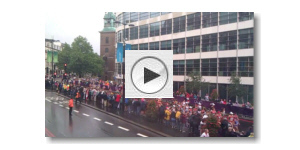 The Centre for Policy on Ageing's offices at 28 Great Tower Street were on the 2012 Olympic and Paralympic Marathon route and this was the view as the women's olympic marathon went by on Sunday 5th August 2012 and the paralympic marathon laps 1 and 2 on Sunday 9th September 2012. From 2012, the Centre for Policy on Ageing will be working closely with the Joseph Rowntree Foundation providing information and support for the JRF Ageing Society programme. 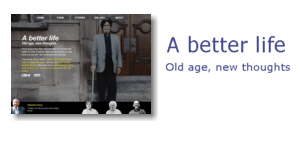 The Joseph Rowntree Foundation has launched a new website: "A Better Life: old age, new thoughts" http://www.jrf.org.uk/betterlife . This site gives older people's voices and perspectives a platform, and through this JRF hope to highlight older people's experiences, resilience and ability to flourish across a century of huge change. 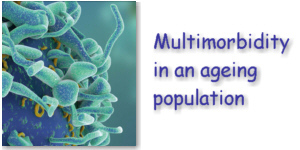 Read more in this JRF blog. 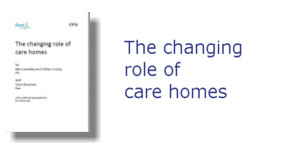 The Centre for Policy on Ageing's report on the changing role of care homes summarises developments in residential and nursing home care historically and to the present day. Using data from the 2003, 2006 and 2009 Bupa censuses of it's care homes residents, the report builts a profile of the current care home population and identifies how that population has changed in recent times and is likely to change in the future. 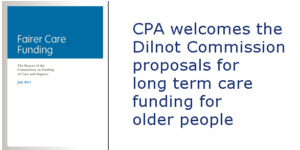 The Centre for Policy on Ageing (CPA) welcomes the recommendations set out in the independent report by the Dilnot Commission published on 4th July 2011. The current funding system for adult social care in England is unfair, unduly complex and has been neglected to the point of near collapse. The Commission proposes a 'strong foundation on which to build reform of the social care system' and one where no-one will be expected to lose all their savings and assets in order to fund often unexpected and 'catastrophic' costs of care and support. CPA urges the Government to act quickly and commit to the Commission's achievable timetable of a White Paper by next Spring. The Centre for Policy on Ageing was commissioned by Bupa to carry out the research for its "Keep Dancing" report, launched on 10th June 2011. The report, was part of Bupa's "Shall We Dance" global challenge, details of which were reported on the BBC "You and Yours" radio programme on 10th June. 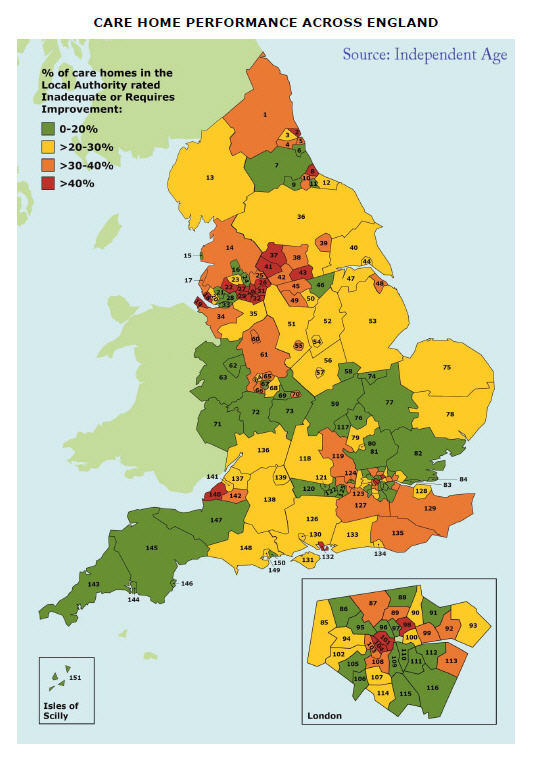 In May 2011 the Office for Disability Issues published the final report of its South East Regional Initiative to promote 'independent living' for older people with high support needs. The regional initiative established both broad principles and individual lessons to be learned from projects taking place in Oxfordshire, Portsmouth and West Sussex. The Centre for Policy on Ageing was a contributor to the work of this project. "Care and Compassion? ", a report from the Health Ombudsman released on 15th February 2011, outlines 10 cases of poor care of older people in hospital. To what extent does this arise from ageism and age discrimination? 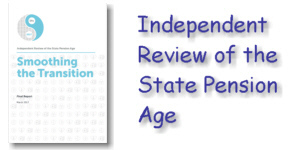 The Centre for Policy on Ageing has recently published a series of reviews of ageism and age discrimination in health and social care monitoring the evidence and making recommendations. 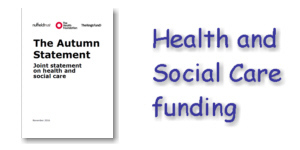 "How can local authorities with less money support better outcomes for older people? ", written by CPA, was launched by the Joseph Rowntree Foundation, as part of its Solutions series, on 19th January 2011. Research shows that older people want and value low-level support - 'that bit of help' But the benefits of investing in this are realised over many years, making it harder to prove impact and protect funding in the face of severe pressure on spending. This review provides examples from across the UK of imaginative, affordable and effective ways of supporting older people's health, well-being, social engagement and independence. 'Reflecting on User-Involvement and Participatory Research', the tenth report in the CABS/CPA ageing research series, was launched at the CABS 15th anniversary event on Tuesday, 2 November 2010 at the Open University. 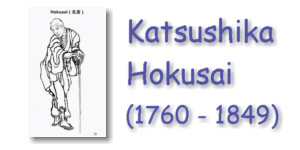 Further details are available on the Publications and Events web pages. 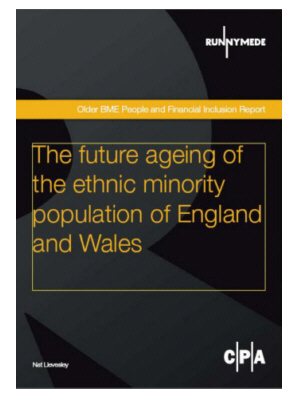 The Centre for Policy on Ageing (CPA) is highlighting its recent report for the Runnymede Trust, The future ageing of the ethnic minority population of England and Wales. 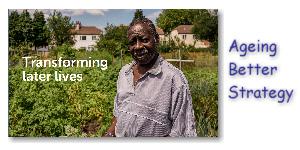 By 2051, in England and Wales, there will be 3.8 million black and minority ethnic older people aged 65 and over and 2.8 million aged 70 and over. The ageing of individual ethnic minority communities will have an impact not only on the need for services but also on the communities themselves. For example, it is estimated that between 2001 and 2051 there will be a 45-fold increase in the number of people with dementia in the Black African ethnic minority community. The full report can be found at www.cpa.org.uk/reportsandreviews. The report was reviewed, and the implications for social care discussed, in Community Care magazine 4th November 2010. The Centre for Policy on Ageing with the Social Care Workforce Research Unit (SCWRU),Kings College, London is jointly hosting a series of afternoon seminars "The New Politics of Ageing". Full details are available in the Events section of this web site.